Volkswagen says the German government’s goal to have 1 million electric cars on the country’s roads by 2020 can be achieved if partly battery-powered cars like plug-in hybrids are taken into account. “We will make our contribution toward this goal,” Volkswagen Chief Executive Officer Martin Winterkorn said today at a panel discussion at a ceremony near chemical producer BASF SE’s headquarters in Ludwigshafen, Germany. Plug-in hybrids “offer the biggest market potential,” and should help with a roll out of electric mobility on a larger scale, Winterkorn said. The CEO reiterated Wolfsburg, Germany-based Volkswagen’s plan to offer as many as 40 electric or hybrid models in the event that demand for low-emission cars takes off. 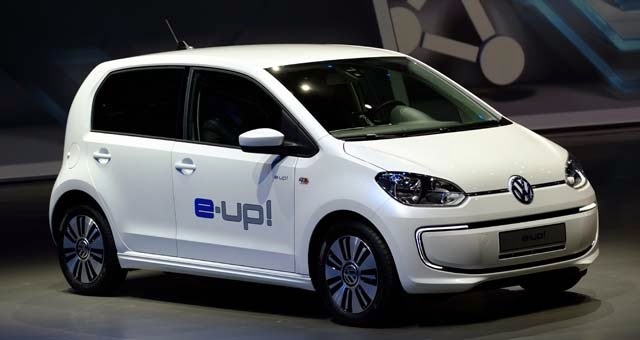 The manufacturer will produce 14 vehicles with alternative drive through next year after introducing electric versions of the Golf hatchback and Up! city car at the Frankfurt auto show last month. Volkswagen also showed new plug-in hybrid versions of the Porsche brand’s Panamera four-door coupe and Audi’s A3 compact. VW’s move echoes initiatives by peers such as Nissan and General Motors to promote purely electric and hybrid cars, which help automakers comply with tightening fleetwide emission regulations across the globe. VW’s e-Up! went on sale in Germany this month for 26,900 euros ($37,000). The model is “deliberately positioned” against the battery-powered i3 city car that Munich-based BMW is bringing out, Rudolf Krebs, head of electric-powertrain technology at VW, said on Sept. 4. BMW presented the i3 in Frankfurt last month, as well as a plug-in hybrid version of the X5 sport-utility vehicle. The i3, priced at 34,950 euros, will enter showrooms in Germany in November. Plug-in hybrids have the most potential and BMW plans to eventually offer one in every model line, Herbert Diess, the automaker’s development chief, said in an interview last month. Cars with electromobility will make up 5 percent to 10 percent of the market by 2020 from well under 1 percent now, Diess said. Other alternative-drive vehicles shown at the Frankfurt auto show included an all-electric Mercedes-Benz B-Class crossover from Daimler that will use a drivetrain supplied by Palo Alto, California-based Tesla Motors, and a hybrid coupe prototype from Volvo Car Group.